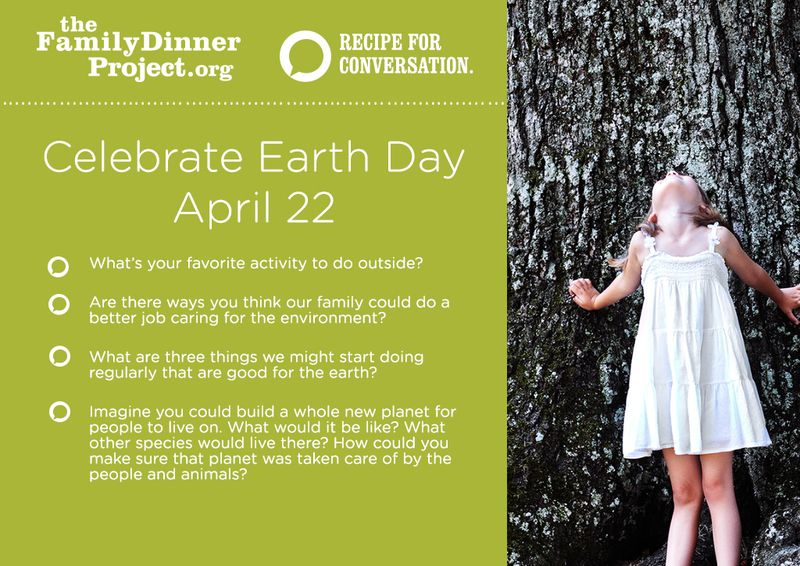 Family dinner, by nature, encourages us to be aware: Aware of making the time in our busy schedules to be together; aware of the foods we cook and eat; aware of the ways in which we communicate with one another and connect at the end of a long day. Beyond being a simple habit or just another part of our routines, you could argue that dinnertime is one of the best opportunities we have to slow down and be mindful of the choices we make and their impact on our happiness and well-being. Building on that mindfulness by finding other ways to focus on awareness at your family dinner table is a great way to add meaning to your meals. 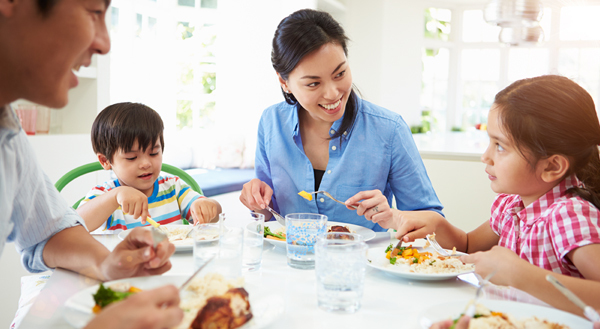 Can you use your dinnertime to talk about issues that are important to you as a family? Choose a cause that’s close to your hearts and make a plan to work on solutions together? Even simply thinking carefully about the benefits you’d most like your family to gain from your dinners together, and planning menus, conversations and games that can help you reach those goals, can make you more aware of the importance of continuing to enjoy that nightly time together. This month, try choosing one of the following awareness campaigns to focus on at one or more of your family dinners, and see how it impacts your experience. April 7 is World Health Day, which this year is devoted to diabetes awareness and prevention. While there’s certainly no guarantee that eating regular family dinners will protect you from developing the disease, the research is clear: Family dinners are strongly correlated with better eating habits, from a reduction in the consumption of sodas and trans fats to an increase in fruit and vegetable consumption. Meals eaten at home also tend to be lower in calories and salt, and the good eating habits established at the dinner table in childhood carry through to healthier diets in adulthood. Dietary factors are a major contributor to the development and management of Type 2 diabetes in particular, so now is as good a time as any to take a closer look at what’s on your plates! Friday, April 22 is Earth Day. There are a number of ways to use family dinner as an opportunity to talk about the health of the planet, but food waste is one of the most often overlooked — and easiest to control — factors that impacts our environment. Did you know that 40% of food produced in the United States each year is thrown out rather than eaten? Or that the typical family of 4 spends over $2000 a year on wasted food? We can do better! Learn more about the problem of food waste and its impact on the earth, and try some of Dr. Anne Fishel’s tips for improving your family’s awareness about eating what you buy, and buying what you’ll eat. One of the most surprising benefits of family dinnertime is its positive effect on literacy and academic skills. We find that families are often unaware that just by gathering for a pleasant meal together, and engaging in rich conversations, they can boost vocabulary, reading comprehension and even grades! Reduce waste this month by using a typically discarded item — carrot tops — in homemade pesto! 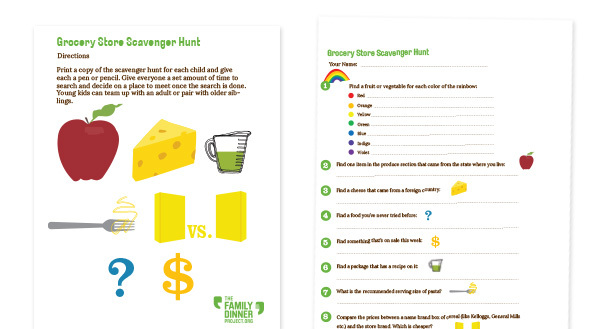 Increase family members’ awareness of the foods you buy and serve with this fun-for-all scavenger hunt! 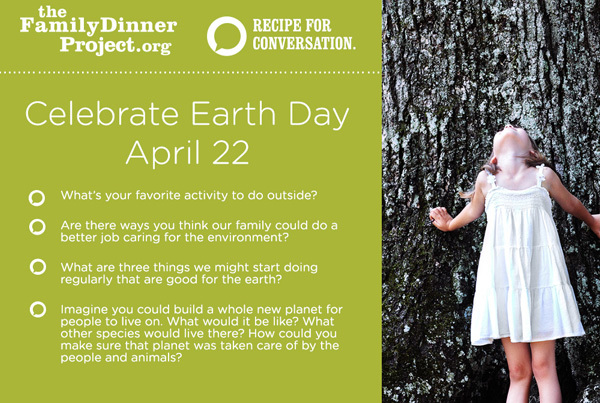 Enjoy this Recipe for Conversation, created especially for Earth Day!